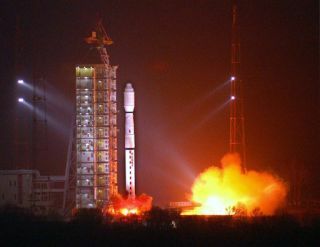 In this photo released by China's Xinhua News Agency, a Long March-4C carrier rocket carrying China's remote sensing satellite "Yaogan III" blasts off from the Taiyuan Satellite Launch Center in Taiyuan, capital of north China's Shanxi Province, early Monday, Nov. 12, 2007. The 2,700-kilogram satellite will be used for scientific research, land resources surveying, crop yield estimate and disaster prevention and relief. China'snewest Earth-watching satellite successfully launched into space early Mondayto survey the country's land resources and aid in disaster prevention, statemedia reported. Just weeksafter launchingits first lunar orbiter Chang'e-1 toward the moon, China sent the Yaogan 3remote-sensing satellite into orbit atop a Long March-4C rocket, according tothe country's state-run Xinhua News Agency. The rocketlaunched into space from the Taiyun Satellite Launch Center in the ShanxiProvince at 6:48 a.m. local Beijing Time, Xinhua reported. The 5,952-pound(2,700-kilogram) satellite will be used to scan available land resources,estimate crop yields and assist in disaster management, the news agency added. Monday'ssuccessful launch marked China's second space shot in less than three weeksfollowing the Oct. 24 liftoff of its Chang'elunar orbiter. The moon probe subsequently reached its final lunar orbitlast week and is expected to spend about one year observing the lunar surface. China isthe third nation, after Russia and the U.S., to independently build and launchastronaut-carrying spacecraft into Earth orbit. Last month, Chinese spaceofficials formally announced plans to develop the Long March 5 family ofrockets, consisting of larger boosters capable of launching heavier payloadsinto orbit, to lift off from a new spaceport to be built on the country'sHainan Island. Accordingto state news reports, the first Long March 5 rocket will debut until 2013,though China is preparing for its third manned spaceflight. The three-astronautmission is slatedto launch in 2008 and may include China's first spacewalk. Chinalaunched its first astronaut in 2003 aboard the Shenzhou 5 spacecraft. Thenation's second manned flight, Shenzhou 6, carried two astronauts when it launchedin 2005.